data sharing – Media! Tech! Parenting! It is a given in this age of connected life that our privacy is much diminished, and it does not matter whether we are children or adults. The trick seems to be for each us to make thoughtful decisions about what family members share and, as much as possible, be aware what is shared or collected about us. For me, this has been an interesting week where privacy and kids’ privacy is concerned, because four distinct events occurred. Kids’ Online Privacy Legislation – Will It Ever Happen? 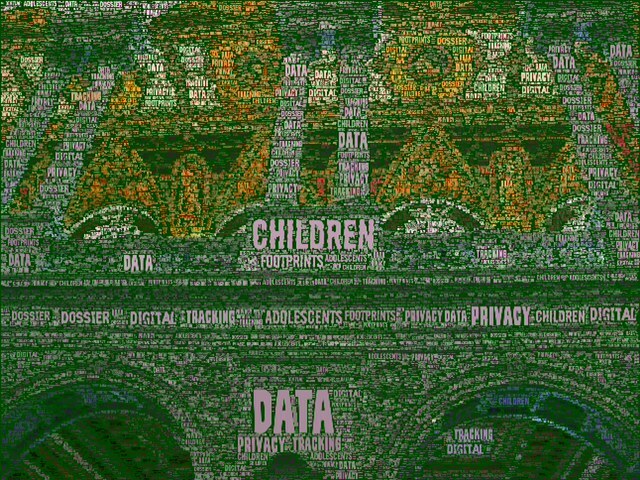 Image made with Wordfoto with a picture taken at the Library of Congress. Much of what a child or teen does online gets added to a digital profile. Even when information is not supposed to be collected, it accumulates – somewhere. Moreover, when a child or adolescent acts impulsively or thoughtlessly online, no way exists to erase or delete a digital mistake. Harvard’s Berkman Center for Internet and Society posts a great digital dossier video that parents and educators may want to use as a conversation tool.